At Visalam you can enjoy traditional Chettinad hospitality and soak up the local atmosphere and culture, which can make a welcome break from busy sightseeing and travelling. The house was built by a prominent merchant for his daughter, and has been carefully converted to create a 15-room hotel full of character and charm, with beautiful woodwork, intricate art deco grilles and even a wrought iron spiral staircase from Birmingham! The staff make you feel at home, and invite you to join them in creating floral motifs out of coloured rice powder, a morning tradition, or to join them in a game of pallaguli, a local board game, or in a stick dance in the evening. Away from the hotel you can pay visits to temples, see faded mansions, tour lively markets, watch craftsmen at work and shop for souvenirs among the antique shops. A ride in a bullock cart is a lovely way to see local life. Staff are happy to help you plan your time. Guest rooms are spacious and high-ceilinged, uncluttered and a pleasing mix of period style and modern comforts. All have en-suite bathrooms with full hot and cold running water. There are several dining areas including the formal dining hall, open-sided restaurant and poolside cafe, all offering delicious cuisine. Regional fare makes great use of spices, and during your stay you'll have plenty of time to sample typical dishes as well as international meals. You're welcome to watch cooks at work in the interactive kitchen and can join the 3-day culinary programme if you want to learn more about local cuisine. Open: Visalam is open all year. Location: Visalam is in Karaikudi, part of Chettinad in the southern state of Tamil Nadu. The nearest airport is Madurai, 90kms and a 2-hour drive away. Rooms: The hotel has 15 rooms. All are spacious, have mod cons such as air conditioning and en-suite bathrooms combined with period furniture and locally made textiles. Activities: The hotel offers culinary courses, sari and dhoti weaving lessons and art workshops. 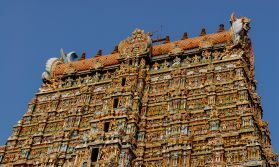 Staff can arrange excursions to local temples, markets, workshops and antique shops. Bullock cart rides are a popular way to explore the area. There are regular cultural evenings including music and dance. Help staff create artworks on the tiled floor using coloured rice powder known as rangoli, or make flower garlands called Poomalai. Staff can also introduce you to Pallanguli, a traditional board game. Facilities: There is a choice of venues: the formal dining hall, the open-sided grill restaurant and cafe. There is a large outdoor swimming pool. Dining: The main dining hall serves local Chettiar cuisine and international fare, the grill restaurant specialises in Tandoor and barbecued dishes, and the poolside café serves a range of drinks and snacks. Children: Children of all ages are welcome, though there are no specific facilities or activities for children. Communication: There is Wi-Fi internet access. "An outstanding hotel in every way. Well trained, knowledgeable staff and lovely food served in a beautiful setting. We would thoroughly recommend a stay here to any one."